This post has 547 views. Some not-so-final thoughts on the first season of Maoyuu Maou Yuusha, which happened to be the only anime series I followed during the winter 2013 season. Maoyuu Maou Yuusha is set at a time where the humans are at war with the demons, and the story is about an unlikely alliance between Maou, the ruler of Demon Realm, and Yuusha, the legendary hero of humanity who was sent to kill Maou. Surprised that Maou is in fact an attractive and friendly girl who wants harmony between the demon and human realms, Yuusha is convinced to join forces with Maou to make the world a better place. Maou proceeds with her plan by becoming an influential scholar in the human world and spreading her knowledge in the poor human kingdoms near the entrance to the demon realm to influence the politics and economics, and Yuusha is sent on various tasks that requires muscle. However, the growing prosperity of the edge kingdoms and increasing influence of Maou draws the ire of the Church and the wealthy central kingdoms and they plot to undo what Maou and her teachings have accomplished. Maoyuu Maou Yuusha has a bunch of different things going on in the show. There is certainly a romantic-comedy element since Maou is obviously infatuated with Yuusha. Yuusha is also attracted to Maou, but in typical fashion the two never quite get things going for various reasons (the interference of Yuusha’s other girl, Female Knight) and non-reasons. Fighting and war also play important roles in the show as Maou’s main goal is to stop the constant conflicts between the humans and demons. 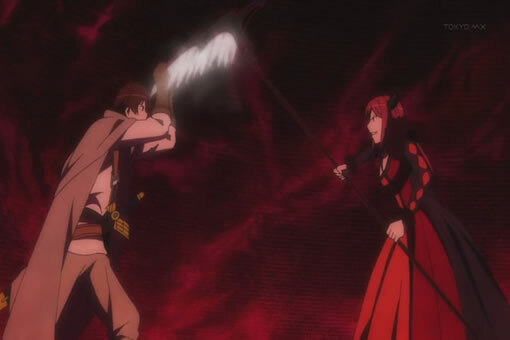 However, action is not the main focus of Maoyuu Maou Yuusha, and as such the battle scenes are merely adequate. The main plot of the story is Maou spreading her vast knowledge to improve the economy of the poorer southern human kingdoms so that they don’t have to rely on war with the demons to get aid from the wealthy central kingdoms. Maou’s teachings include the growing potatoes, rotating crops, and developing smallpox vaccines; these thing don’t sound particularly impressive to people from the modern times, but their effects are quite profound for the medieval societies in the show. Due to the simplistic nature of Maou’s ideas, the ideas’ effects on the politics and the economies of the kingdoms is easy to follow, although I wished the show would go more in depth and some more clever maneuverings and scheming. It was only the first season of the show and the story is only beginning to unfold, so I suppose the really interesting stuff will come in later seasons. Overall, the first season of Maoyuu Maou Yuusha was decent. The show doesn’t do anything particularly well, but the whole package of romantic comedy, action, war, and economic and political maneuverings is not displeasing. The next season show have more intrigues now that the Church, the central kingdoms and the demon tribes they are in cahoots with are starting to move against Maou.